When my sister Candy (one of the authors of this blog) and her husband moved to Texas for his job I knew that airports and flying were going to become a way of life since there was no way I could go more than a few months without seeing my sister! We are really fortunate that we live between two airports: a major airport and a smaller more local airport. We have a lot of flights to choose from when flying between Florida and Texas. However, recently the least expensive choice has been flying in and out of the smaller, local airport on the discount airline Allegiant. I know that there are many people who hate this airline but I have mostly had positive experiences with them but you do have to expect that you will probably be leaving and arriving somewhat late. Usually the delays are under an hour and they are frequently $200 less than the next cheapest flight. In addition, they are the only option when flying our of the small airport and you don’t have to arrive very early if you aren’t checking a bag. All of this being said, the only bag you are allowed to bring on this airline included for free in the price of your ticket is a personal item bag. Your Personal Item (like a purse, briefcase, or a small backpack) must be stored completely underneath the seat in front of you. While I was actually on the plane I measured with a pocket tape measure and the under seat dimensions where the bag has to fit is actually closer to 15 x 10 x 16 so if you are a little over 7 inches you should be okay. They don’t usually check the personal items that closely. I’ve actually never had one checked at all but I have seen people charged right before getting on the plane when their bags were obviously too big and then it costs $50 per carry on bag. It costs $30-$50 to add a carry on or checked baggage prior to a flight. I would be lying if I said I didn’t see this as a money saving challenge. I wanted to make sure that this process is as easy as possible because I fly frequently and don’t like feeling like I’m dragging around a ball and chain while waiting at the airport. The difficult part way trying to find a bag that would fit as closely into the maximum dimensions as possible so that I could bring as much stuff as possible in what would ultimately still be a very small bag. For me it was an easy decision to purchase a rolling laptop bag because being able to roll a bag is much easier on my back. I ended up purchasing the above Protege 16″ Rolling Briefcase with Laptop Section, Black bag from Walmart (I try not to shop at Walmart but I needed it right away) for about $35. You can find it here or in a store. The dimensions are 16 x 8 x 13. I know that this is technically 1 inch over the requirement for Allegiant but if I don’t stuff it until it bursts it can still measure at 7 inches. I’ve boarded 5 flights with this strategy and I’ve never had a problem. No one has even looked twice at my bag. If you are looking for a bag, I also think this very similar $40 Targus bag from Amazon Prime would work. To start with I will show you what I wore to the airport in the following picture. The Cat is only in the picture. I doubt she would have made it through TSA! Between what I was wearing and what I packed I ended up with 5 tops, three bottoms and a dress which is more than enough clothing for a week long trip. I measured and remeasured the bag before and after I packed and it still fit into the strict Allegiant Airlines Personal Item Guidelines. My bag wasn’t stuffed when I was done and I could have fit more inside. It made a huge difference that I put my clothes into gallon freezer bags and removed all of the air inside the bags and that save a ton of space. 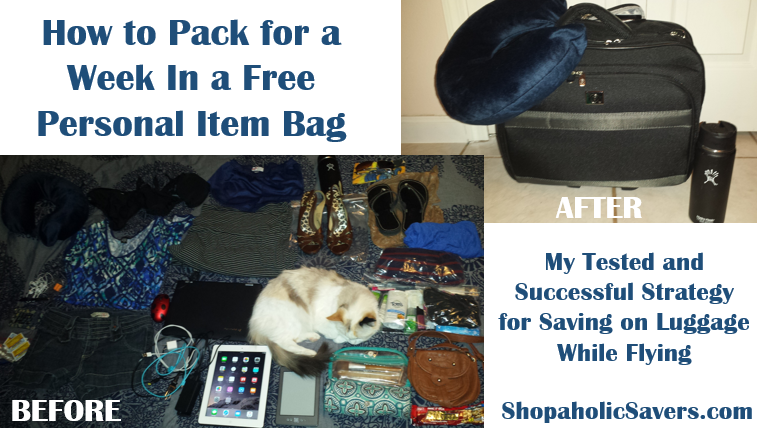 This gallon bag strategy worked out much better than using my packing cubes that I originally thought I would use. I have learned my lesson and I also usually pack the above duffel bag from IKEA that is meant to fold up in a square that is almost flat. That way if I decide to go shopping while on vacation and bring a bigger bag home then I don’t have to buy one. It also costs significantly less to bring an addition bag home than it would to bring one round trip. I also am no longer as worried about not stuffing my bag to the limits. I know that my bag will fit the dimensions under the seat and I put as much as it can carry into it. 1. Find out the dimensions of the personal item you are allowed to bring for free and purchase a bag that is as close to the maximum dimensions as possible without going over. I highly recommend a rolling bag because it is easier to maneuver through the airport and then you don’t have to worry about the weight of your bag as there is no weight restriction on most airlines personal items. 2. Wear your bulkiest clothing items on the plane so that you don’t have to fit them in your bag. I always wear a couple of shirts, a jacket and my bulkiest shoes because I am usually cold anyways. 3. Wear a jacket with large pockets on the plane. This way you can put additional items in the pockets like snacks, your water bottle, etc. that would usually take up more space in your bag. 4. 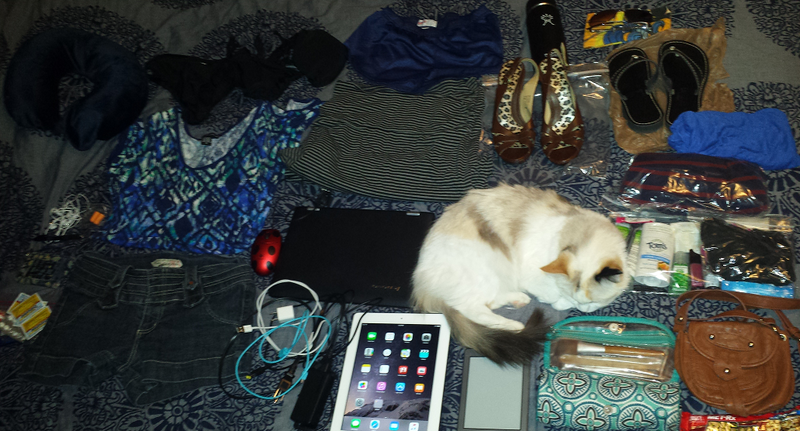 When packing choose clothing items that can be mixed and matched for different outfit combinations. 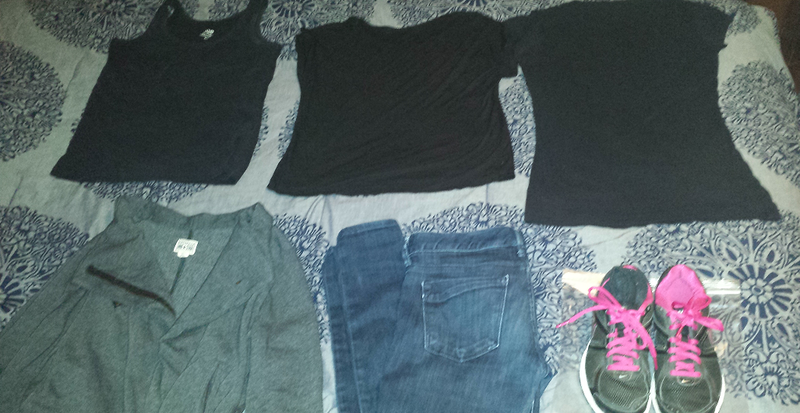 I usually choose black basics so that they match with everything. I also bring clothes that can be dressed up or down. Look up the weather before you go so you know what you are most likely to need. I actually find that I usually bring more clothing than I need. 5. Put your clothes into gallon plastic bags and press on them to remove the air. This will condense the bulk of your clothing so you can pack more in a small space. I am amazed at how well this works. I tried using packing cubes but this works 10x better and they are cheaper. Don’t forget to pack a few extras in case they rip. 6. Make good use of your technology so that you can pack less stuff. My phone is my camera, guidebook, GPS, ticket etc. My kindle allows me to bring plenty of reading material on every trip instead of hard copy books. Remember that often pictures are the best souvenirs anyways! 7. Bring a water bottle like My Hydroflask (to fill once through security) and snacks for the plane so that you are not tempted to buy them during the flight and you aren’t starving when you get off the plane. 8. Pack a flat folding duffel bag in case you decide to bring more home than you brought with you. I enjoy thrift shopping in new places so I am often guilty of wanting to bring more home than I took with me. This way, I never have to buy a bag to take home. The above duffel bag from IKEA was a great buy and it’s cheaper when purchased directly from the store. 9. Measure and re-measure your bag once it is full to make sure that it fits the maximum dimensions. If you personal item bag is too large you can be charged $50 just to board the plane. I have never had this problem but I have seen angry people with their too large bags who have. You don’t want this to be you. 10. Put items you need to remove during security and on the plane in easy to reach places in your bag so you don’t have to pack and repack. This also ensures that you aren’t left searching through your bag at the last minute. Taking one small bag means that I don’t have to arrive early to check a bag, I’m not juggling a bunch of luggage, I don’t bring more than I need, I’m not worried about dealing with the overhead bins and it overall streamlines the whole travel process.